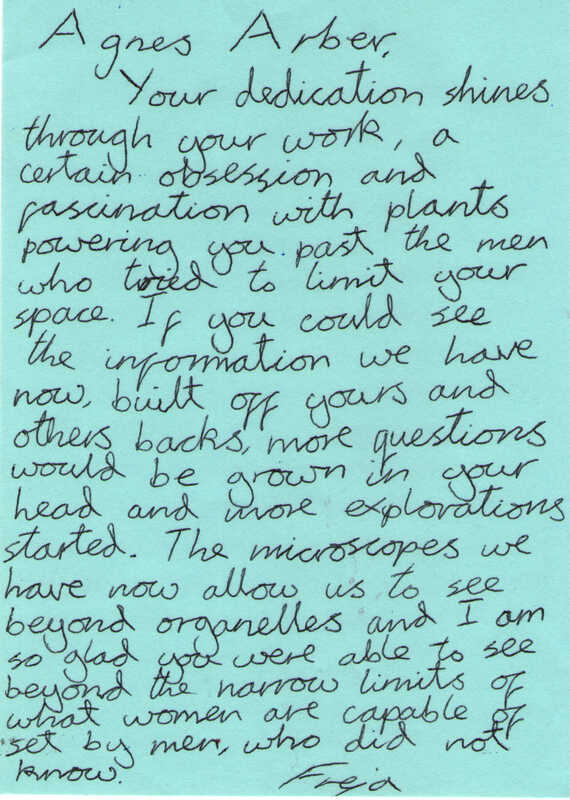 To Agnes Arber, plant morphologist and anatomist, historian of botany, and philosopher of biology. From Freja Bailey. Your dedication shines through your work, a certain obsession and fascination with plants powering you past the men who tried to limit your space. If you could see the information we have now, built off yours and others’ backs, more questions would be grown in your head and more explorations started. The microscopes we have now allow us to see beyond organelles and I am so glad you were able to see beyond the narrow limits of what women are capable of set by men, who did not know. plant morphologist and anatomist, historian of botany, and philosopher of biology. Born 1879, died 1960. More information about Agnes Arber.